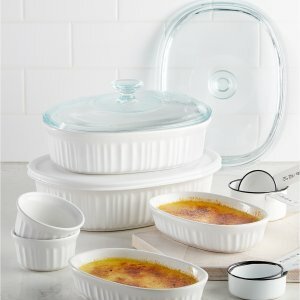 Macys.com offers the Corningware French White 10-Pc. Bakeware Set for $17.99 via $10 rebate . Free shipping on orders over $49, or free with any Beauty Item (from $4). Features: Classic fluted stoneware dishes in a range of sizes move from prepping in the kitchen to serving on the table with effortless ease. The larger bakers include plastic & glass lids that let you take meals on the go or store them in the fridge or freezer.